Mosel Fine Wines | Auction Guide 2016 is out! 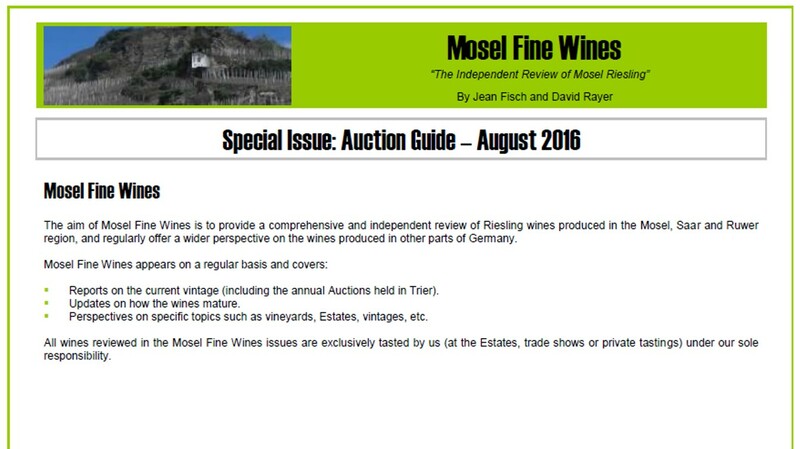 Mosel Fine Wines | Guide to the 2016 Trier Auctions is out! As every year since 2009, we publish a full report with detailed tasting notes ahead of the Annual Trier Auctions to be held on next Sep 15-16. The Bernkasteler Ring and the Grosser Ring / VDP Mosel have both been holding annual Auctions for over a century now. The 2016 edition will respectively take place on September 15 and 16, 2016. At these auction events, member Estates of these two grower associations offer some of their finest casks of wine on sale. Except for some mature rarities, auction wines are different from the ones sold via regular channels. These are typically made from particularly privileged parts of a vineyard, from very old vines or from particularly ruthless grape selections. Auction wines often form a pinnacle of Mosel Riesling. Most of our greatest Mosel wine memories have nearly all come from auction wines (for those Estates that are members of the two grower associations). You can learn more about these Auctions, auction wines and how to participate in this Introduction to the Annual Trier Wine Auctions. At the 2016 Auctions, some of the finest casks from the great 2015 vintage will sold off. As we explained in the Mosel Fine Wines Issue No 31 (Jun 2016), the sweet spot of the 2015 vintage is at Spätlese and Auslese level. Not surprisingly, the quality of the 2015 auction wines is as high as we have ever tasted in our 20+ years of auction history. Prices for these modern day legends are likely to be high. However, as every year, we expect that some bargains will be possible! In addition to wines from the 2015 vintage, some cracking mature wines will be auctioned off this year as well, including a 2005er Joh. Jos. Prüm Graacher Himmelreich TBA and a 2001er Dr. Pauly-Bergweiler Bernkasteler alte Badstube am Doctorberg TBA. Ever since we started, we have been publishing a full report with detailed tasting notes for all wines on offer ahead of the annual Trier Auctions in order to provide Mosel wine lovers with all the information they need should they wish to bid on some bottles. This Guide to the 2016 Trier Auctions is being sent out as we write these lines and all subscribers should have received their copy by tomorrow. You are a subscriber and miss this Issue? Simply send us a request by email and we will be happy to send you a copy. You are not yet a subscriber and wish to get this Issue? Subscribe free of charge by registering yourself here below and ask us for a copy by email.